As promised, here is the recipe for my “Abyssinian Twirling Wax”, a Frankincense summer styling wax made with the oleoresin of Frankincense Frereana, co-op harvested in Somaliland. The Frankincense resins in the formula can be replaced with Spruce, Pine or Fir resins if desired. I chose Frankincense Frereana because of its wonderful fragrance and lack of water-soluble gum, perhaps the only Frankincense with this quality. This allows it to dissolve readily in the oils and butters, as the coniferous saps do. Much as I love my spruce sap moustache wax, (solid moustache wax recipe), I find I am always learning, growing, exploring, and discovering new things. I better be improving with age. Instead of adding olive oil as a solvent and carrier with the spruce sap in my earlier recipe, I mixed the hot cocoa butter and the coconut oil with the semi-melted Frankincense which gave the resin enough mobility to be filtered through a metal mesh coffee filter. (Easier on the hands than squeezing hot resins through a pillowcase! ). It was then put back in the water bath in the mixing vessel and the rest of the ingredients blended into it till the texture and consistency were just right. This method works just as well with Pine, Spruce and Fir saps. Resins have the very cool attribute of training or “perming” ones hair. After using a resin based wax for a day or two, one’s moustache notably keeps its shape with less or no waxing. Hairs may still separate, but they will do so according to the shape the resins imparted to them. When you want to try a different style, the resin wax holds it exactly where you want it and sets your facial hair to the new style with the same ease. Simple or extremely elaborate creations are thus possible with no extra effort. So here is my new and improved recipe for a really lovely resin based, solid moustache wax This recipe is pretty close to the “Abyssinian Twirling Wax”. The product in the shop also has resins of Frankincense Rivae from the Ogaden region in Ethiopia, (hence the Abyssinian part), but it is not a prerequisite for a wonderful product. To it, I added some Frankincense Rivae resin left over from distilling the essential oils, but you could simply add a little essential oil of Frankincense Rivae to accomplish the same end. These two fragrances compliment each other well. You can experiment with a wide range of ingredients and proportions. A little more Frankincense adds durability and hold in hot humid conditions, a little less, works well in cooler climates. We all have different needs from a grooming wax, so take the time to play with the proportions and ingredients, and do a”drop test” on a room temperature surface as often as you need, till you are happy with the results. I often do this 10 -20 times till I am satisfied. Remember you can re-melt and redo your wax almost indefinitely. Just return it to the waterbath at any point to experiment , add or adjust ingredients. -The Cocoa butter helps it go on smooth without pulling hairs and smells wonderful with the Frankincense. -The coconut oil is semi solid at room temperature so I figure it is better for consistency than olive oil, and of course it’s all the rage now for skin, hair and everything else it seems. -I always use fresh fragrant local Beeswax, not the bleached or deodorizer stuff. Fresh beeswax smells amazing complements the resin’s fragrance, and adds a lovely texture and hold of its own. You can use any kinds of oleoresins you like or have around, in similar proportions to those below. This recipe yields 1 liter of moustache or beard wax. The percentages should help you make smaller quantities. For a beard wax or dressing, I would reduce the resins and Beeswax, and up the Lanolin and Cocoa butter till you have the consistency and hold you are looking for. I hope to get some in the shop sometime soon. Frankincense Frereana-125 grams for a summer wax. 100 grams might work well for a winter or cold weather wax. 100 to 125 grams-10%-12.5% . (Or 150-200 grams-15% -20% Spruce, Pine or Fir sap). Vitamin E. 400 IU per 250 ml. or more. It helps preserve fats from rancidity and is nourishing to hair and skin. Not obligatory, but an option. Essential oils if you like. You can add essential oils of your choice during the cool down period, before you pour your wax into containers. The fragrance of the Frankincense, Beeswax and Cocoa butter combined is warm, mild, woody and lovely on its own. Some oils that go well with Frankincense Frereana are other Frankincense types, Cedars, Opoponax, Balsam Peru, Cabreva, Muhuhu, Sandalwood, Pettigrain and citrus types. For more essential oil suggestions and information on how to incorporate natural fragrance in your moustache wax, please see the post How to create a natural fragrance for male grooming products. Fresh co-op harvested Maydi- Frankincense Frereana-Natural chewing gum, incense and moustache wax ingredient. So, in the water bath, heat up all your ingredients. Wait till your water boils and everything has melted. Gauging by eye, or with a thermometer wait till they reach a similar temperature. Add part of the Cocoa butter and part of the coconut oil to the gooey Frankincense resin, stir thoroughly till it is homogeneous and all the Frankincense has dissolved. Remove and carefully pour it through a metal coffee filter via a funnel or directly into your mixing jar. Use the back of a spoon or a stir stick to press it through and keep the pores in the filter open. If you have a large quantity, do this in small batches and return the Frankincense mix to the water bath to keep the contents liquid. If you can’t get a reusable metal coffee filter, (The gold coloured Melita type), then use the corner of a clean and well rinsed pillowcase, and wearing gloves press the mixture through the fabric and funnel to the jar.Any residual goo left on hands and tools cleans up well with olive oil then soap and water. Put the container with the filtered mix into the water-bath, wait till it is same temperature as the rest of the jars, and you are ready to start adding the remainder of the ingredients to it. I ususally don’t pour things in all at once, but reserve some for final adjusting. 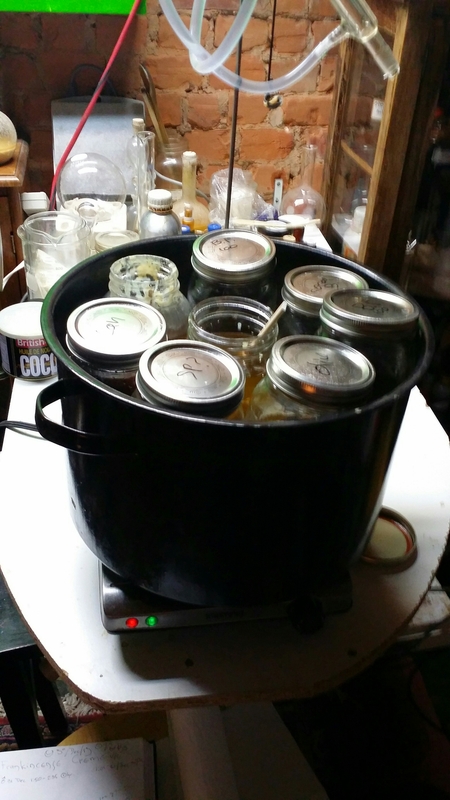 Often I will measure more into the jars than the recipe calls for, just so I have some room for play. Its easy enough to measure what I have left over afterwards and deduce how much I used. Add most of your ingredients then do a cold drop test and see if it suits your needs. More Cocoa butter? More beeswax? Coconut oil? What do you think?? When you are happy with the result, you are ready to pull it out of the waterbath and either mix in your essential oils or just pour it into containers to set. And that’s it. Enjoy the gender you were blessed with this life. And always always remember to take notes! Clear legible and dated notes! Abyssinian Twirling Wax. A Frankincense based Moustache wax. In the Etsy store. Housemate Jesse James, a regular user of Abyssinian twirling wax. I have a question, if im looking to make myself a firm mustache wax, but leaving the resin out, and using only beeswax, lanolin, sweet almond oil, and shea butter, could u give me like a general idea on some ratios? It’s embarrassing the amounts of all these ingredients ive totally wasted trying to make myself a good mustache wax, its actually driving me crazy. So if you could steer in the right direction, or at least the general vicinity I would greatly appreciate it . Beeswax, Lanolin, Sweet Almond oil and Shea Butter are all too soft and on their own, will never create a firmer product than you have already experienced with them. To create a harder, firmer, more tenacious moustache wax you have to add ingredients that are harder. This is where resins come in. You could start by adding 10% rosin or Dammar resin to your formula and see what it gives you. My favourite hard resin is that of Frankincense Frereana. It dissolves in the warm oil/wax mixture, adds hardness and a lovely fragrance. Play with the proportions from there. You can also experiment with adding a wax that is firmer than Beeswax such as Carnauba wax or Soy wax. In short, you must add harder ingredients if you hope to create a harder product. Can you use frankincense serrata powder as the resin in mustache wax? In theory, you can use Frankincense Serrata powder in your moustache wax, but since it is an oleo-gum-resin and has a good amount of water soluble gum in it, you will end up with a product full of undissolved grit from the gum. You can work around this by first preparing a resin extract or an oil extract of the powdered gum. Both these methods remove the gum and leave you with a pure oleoresin and a smooth product. Here are links to the recipes. 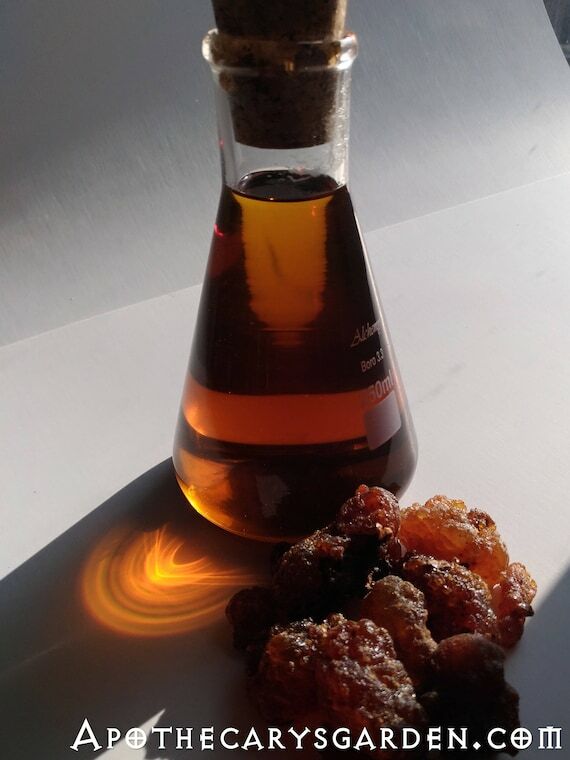 https://apothecarysgarden.com/2014/07/30/how-to-make-a-whole-extract-of-frankincense-and-other-oleoresins/?wref=tp. Alternatively, if you use the powdered Boswellia Serrata, you could try to filter out the gum granules while your moustache wax is hot and liquid, before you pour it in containers. 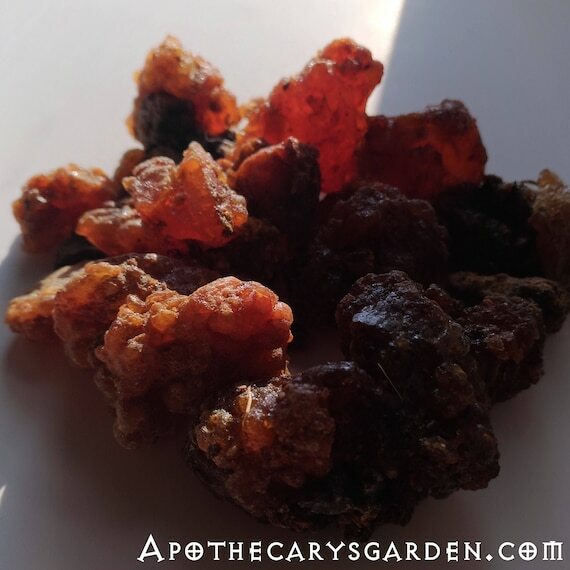 A more direct and simpler approach is to use resins that contain no water soluble gum such as Frankincense Frereana, Frankincense Neglecta Thurimel, or “Light” Frankincense Neglecta, Pine, Spruce, or Fir saps or rosins, various types of Elemi resin and likely the Copals. Each will lend similar qualities and a different fragrance to your moustache wax. My moustache hair is really corse coarse and has a mind of its own as I like to say and I’m thinking about making my own moustache wax. You really got me interested in Frankincense Frereana. What is the price od this resin since I can’t find the listing on your Etsy page. Hi Tom. I’m happy you found some useful info here. I am indeed currently out of Frankincense Frereana at the moment. I am expecting a shipment of fresh resins from Somalia the next few weeks. If you can’t find any from other internet sources, check in my store again later this month. The Frereana is a bit more expensive per ounce than the other Frankincense types, but won’t break the bank. Plan on trying this recipe out, was wondering if you have tried powdered Frankincense Resin? I am wondering for it seems like it would make the mixing process a bit easier. Thanks for checking out my blog and this recipe. Since the conifer saps and Frankincense Frereana melt nicely in the heat of the water bath, it makes no difference if they are first powdered. They are going to turn liquid as soon as they warm up. 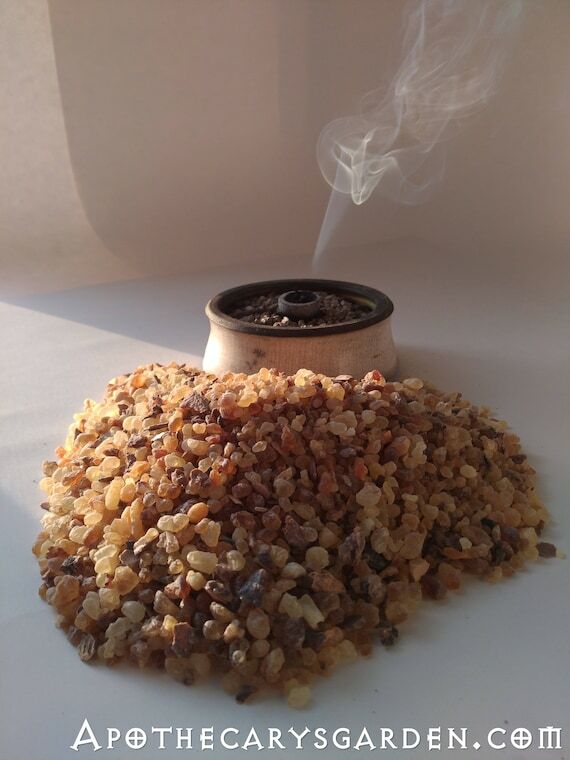 The other and regular types of Frankincense will not melt this way, though if you powder them the resins and essential oils will indeed infuse in the hot oil. You will however be left with a lot of undissolved gum residue which you will have to filter out of your wax. It can be done with other types of Frankincense, but via a slightly different process and recipe. I hope this was of some help Tyler. Yes it helped a lot, made me realize not to purchase the Frankincense powder I was looking at. I was aiming to get something as prepared as i could to skip having to strain it etc. Wanted to see if I could find a lazy way around it. I understand completely. It’s always good to stay away from powdered resins anyway since you really can’t tell what is in them and the essential oils evaporate quite quickly once they are exposed by grinding. If you can get your hands on either fresh Pine or Spruce sap, pure Pine rosin, or ideally, Frankincense Frereana, which I am unfortunately out of temporarily, you could make it the easy way. Best of luck with it Tyler, whichever path you choose..
Having trouble getting the resin to melt without burning. Do I just need to be more patient? or did I get crappy resin. I am only on 25% heat on my burner. Which type of resin are you using? And more important, are you using a water bath?? Thanks for this. I live in Kenya, and intend to collect some acacia tree resin this afternoon. My only worry is how to remove the resin-with-wax from my moustache when I’m finished with it, in a place where I know of no ‘moustache wax remover’ being sold. Will it just wash out with soap? (And, would I need to re-wax with this every day, or would it stay in happily for a few days?) Thanks. I hope my response is not too late. To the best of my knowledge, Gum Acacia is a water soluble gum with little or no oleoresin. This means it will not mix with oils and waxes without the help of an emulsifying agent, unless, you plan to use the finely powdered gum as an emulsifier in your moustache wax. In the case of the former scenario, you have undoubtedly discovered it will not replace the oleoresins in the recipes on the blog and will not mix directly with the waxes or vegetable oils. In the latter scenario, you would have found a recipe somewhere else with instructions on making a water/wax/oil product with the help of the gum acacia. If the latter is the case, warm water and soap should remove this type of wax fairly easily since the gum Acacia will break down with the warm water and release the product from your facial hair. That being said, I hear there are some wonderful types of Myrrh and Frankincense growing in Kenya. Any chance you could access any of these? If so I could more easily help you with a moustache wax and I would also be interested in acquiring some of your local oleoresins. Again, I Apologize for the delay and hope I have been of some small help in your pursuits. I don’t know what frankincense smells like (My first guess was incense made from frankfurters) so I’m off to the nearest whole food to snort up all their essential oils again. Thank you Dave. So good to have your wit back with us! Thank you Stu. Lovely seeing you around and getting your input.